Philip Street was convicted alongside Andrew Bent at the Old Bailey on 1 November 1810. Philip’s family background helps to explain why he was granted a full pardon for their joint crime, while Bent was transported to Van Diemen’s Land in chains. His story and that of his family also illustrates the web of connections stretching from Britain to the Australian colonies, and their further entanglement within the colonies as they grew and flourished. Street’s execution in 1816 highlights the fine line trodden by the criminal classes between opportunity and death. Philip, who was probably born around the turn of the year 1792-3, was the fifth of eleven children of Thomas Street and his wife Mary Ann, née Matheson. Philip was baptised at St. Mary’s Church Harrow on the Hill on 17 February 1793, his name recorded as Philemon Charles Street. For some reason the father appears in the register as William Street for several of the middle children, including Philip. The family name Street can be traced back for several generations in the registers of St. Mary’s. Thomas Street was the blacksmith and farrier in the small rural village of Alperton (or Apperton) near Ealing. Ordnance Survey First Series, Sheet 7 (detail). Data provided through www.VisionofBritain.org.uk Historical material copyright of the Great Britain Historical GIS Project and the University of Portsmouth. licensed under the Creative Commons Attribution 4.0 International License. The family also had connections to the parish of Saint John the Evangelist in Westminster. Thomas and Mary Ann were married there in 1783; their first child, a daughter, was baptised there; and they were both buried there. An earlier Thomas Street, farrier of that parish (will proved in 1765) may have been related. In May 1805 Philip’s father became an executor and also a beneficiary under the will of Benjamin Thomas, another farrier of Saint John the Evangelist parish who owned a considerable amount of leasehold and freehold property. Soon afterwards, in November 1805, with his youngest child still a baby and Philip aged about 12, Thomas Street himself died aged 44. This was probably sudden as there was no will. Mrs. Street, who now received the benefits from Benjamin Thomas’s estate, continued to conduct the smith’s business. After her death in 1831 it was sold up to provide for two grandchildren under the terms of her will. There is nothing to indicate that the family was not generally respectable and law abiding. Sons Benjamin and Samuel both married and had families, and pursued apparently successful careers as veterinary surgeon and farrier (Benjamin) and watchmaker (Samuel). But for some reason the oldest son Thomas and third son Philip went off the rails, and in 1810 both were convicted of crimes committed in London. It is not clear what they were doing in the metropolis, or why Thomas was not, as might have been expected given he later had obvious skills as a blacksmith, helping his mother with her business. There is no physical description of Philip Street although Thomas was later recorded as tall, dark and “good looking.” Judging from his correspondence he was quite literate. We do not know when or how Philip and Andrew Bent became acquainted or how well Bent knew Thomas. Philip may have been, like Bent, an apprentice printer although he was not bound through the Stationers’ Company, but then neither was Bent. In what appears to be simply an extraordinary coincidence a man named Philip Street was, in 1810, working for John Walter as publisher of the Times. Around the time of young Philip’s court appearance he gave evidence at the Old Bailey trials of some of Walter’s striking journeymen printers. We can establish no connection between this man and the Alperton family of Streets. Nor can we find any connection between them and the Thomas George Street who was editor and part proprietor of the Courier newspaper. By the time Andrew Bent and Philip Street appeared in court charged with the Clare Market burglary Thomas was already cooling his heels on the Zealand hulk at Sheerness. He had been there since July but his recent experience appeared to have had no salutary effect on his brother. On 1 March 1810 Thomas had been caught red handed making off with a large roll of kerseymere cloth (value £7) snatched from the counter of a Fleet Street mercer. The prosecutor lived on the shop premises so the charge was that of stealing from a dwelling house. There were no obvious accomplices. Thomas was tried at the Old Bailey before the Recorder of London (John Silvester) on 11 April. Like Philip later on he appears to have understated his age by about 18 months – he was really nearly 22, not 20. When found guilty he received the mandatory death sentence but was recommended to mercy on account of the good character given him by four witnesses. These were probably respectable clients of the blacksmith’s business, who may have had their services requisitioned again in November on behalf of his younger brother. The sentence was commuted to seven years’ transportation and Thomas was shipped off on the Admiral Gambier. Hulk records show him transported on 10 March 1811 although the ship did not leave England until 12 May. Bent was taken to the Zealand hulk on 22 April, so they just missed each other. Philip was never transferred to the hulks, nor did he ever come to Australia. He stayed in Newgate and was granted a free pardon on 1 November 1811, a year after his trial. There was a petition which does not survive and the exact date of which is unknown. The warrant for his release, dated 1 December, confusingly suggests his original sentence had been commuted to transportation for seven years, although Newgate lists show he remained under a life sentence until the free pardon was obtained. By this time both Andrew Bent and Thomas Street were well out of the country and facing an uncertain future. Bent was at Rio on board the Guildford and Thomas was already in Port Jackson. Philip seemed to have been, in comparison, very lucky, but in the end things worked out rather differently. Philip disappears from view for a few years, apart from unaccountably being baptized for a second time on 1 March 1815 at St. Martin’s in the Fields, Westminster. No date of birth is recorded in the register, but given the uncommon name, and with the parents stated to be Thomas Street, farrier, of Harrow and his wife Mary Ann, this was surely the very same Philemon Charles Street. Perhaps the second baptism was some sort of insurance policy – for early in 1816 Philip either embarked on a spectacular new crime spree or his regular activity as a professional burglar finally caught up with him. Perhaps he was corrupted by the pernicious company he kept while in Newgate or thought, based on his brother’s experience, that a few years’ transportation would not be all that bad. Perhaps he had remained, all along, a “well-known character” while managing to evade the authorities. His luck ran out when on 30 March he was committed on no less than nine separate counts of burglary. Only some of the cases actually came to trial and all of these involved break-ins at properties in the West End in February. Constable Samuel William Pyall told how when he went to the prisoner’s lodgings late at night on the 15 March he found large quantities of stolen property there. This included saddle cloths, spurs, a pistol, assorted household linen and a large quantity of miscellaneous clothing. There were also pick-lock keys, crowbars, matches and phosphorous – all standard tools of the burglar’s trade. In the first case heard Philip was found guilty of stealing goods worth 39 shillings, but not of burglary. In the second he was found guilty of burglary and stealing. There was a glimmer of hope when his counsel Mr. Adolphus made an ingenious legal objection to the way the prosecutor’s name was recorded in the indictment and the judge reserved the option of referring this point to the twelve judges. But the third case saw Philip’s goose fully cooked. He was again found guilty of burglary and it was at this point deemed unnecessary to hear any more of the charges. Philip was spared any caustic remarks from Chief Justice Ellenborough because this time it was the Recorder of London John Silvester who donned the black cap. Once more friends and clients of Mrs. Street rallied around. On 2 May her petition, asking that her son’s sentence might be commuted to transportation for life, was sent in via the Duke of Kent whose country residence was in the neighbourhood. His covering letter in the Hatton Papers indicates that support came from wealthy coach builder Thomas Willander of nearby Twyford Abbey, the Messrs. Wood of Hanger Hill and a clergyman who was, like the others, a “respectable neighbour” of the Duke. Philip’s case was considered on 8 June. Saturday. The Prince Regent held a Council at Carlton-house after which the Recorder of London made his report of the several persons convicted at the last April sessions, when two were ordered for execution on Friday next, viz. Philip Street for burglary … There were nine indictments against Street for burglary upon 4 of which he was capitally convicted—Bury and Norwich Post Wednesday 12 June 1816. The decision was touch and go. The list submitted for consideration has a draft note in pencil which reads “Transported for [7? ]” This was deleted and the final decision was that the law should take its course. The other person still to hang was the unfortunately named lad, James Blunder, convicted of highway robbery. On 12 June the Duke of Kent forwarded another petition from the now frantic Mary Ann Street. Philip was obviously clutching at straws. The Duke of Kent presents his best regards to Lord Sidmouth and having just received the accompanying petition from the widowed mother of a convict who it appears is ordered for execution on Friday next and states that he has it in his power to make [awful?] discoveries with respect to the actual perpetrators of the crime for which he stands convicted has felt it a duty to transmit the same to His Lordship in order that he may be enabled to act upon it in such a manner as he shall think proper. The Duke judges it right to add, that the poor woman in question resides at a [short?] distance from this place, which is the occasion of her having addressed him upon the subject. The case of the Prisoner having been fully considered at the Report which was lately made in Council, Lord Sidmouth is sorry to acquaint HRH that he does not perceive any circumstance stated in the Petition now before Him, which would warrant his advising The Prince Regent to Extend the Royal Mercy to the Prisoner in question. 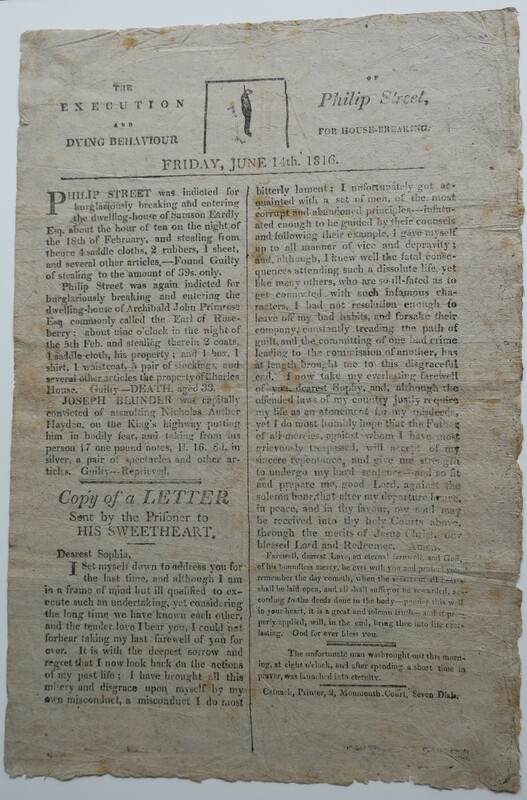 Philip was executed the next morning, 14 June, just two weeks after Bent, in Hobart Town, had commenced his newspaper, the Hobart Town Gazette. Brother Thomas, in New South Wales, was also beginning to get on his feet and had received a conditional pardon the previous year. James Catnach, printer in Seven Dials, who churned out a constant stream of execution and transportation broadsides, street ballads and other catchpenny works on rough paper, published a folio broadside on Philip’s execution. He did not have much material to work with. He included a brief description of Philip’s crimes, a statement that young Blunder had been reprieved, and a copy of a purported letter from the prisoner to his sweetheart Sophia expressing penitence and remorse. This sentimental effusion was almost certainly completely fictitious and tells us more about Catnach’s editorial approach to filling up space than about Philip. It tells us nothing of the almost unimaginable anguish of Mrs. Street’s final meeting with her son. The brief account of the actual execution stated that “the unfortunate man was brought out this morning at eight o’clock and after spending a short time in prayer, was launched into eternity.” By some quirk of chance a copy of this broadside survived and when it came on the market several years ago was utterly irresistable. Philip’s body was returned to his grieving family and buried at the cemetery of St. John the Evangelist in Horseferry Road on 21 June. He is recorded in the register as Phillemon Street, aged 23, abode Broadway. Bent may have read of Philip’s trials and execution in the London newspapers, although not many of these reached Hobart Town in 1816-17. Perhaps he heard the news directly from Thomas, if they kept in touch, or from his old comrades at the Public Ledger newspaper or even from his own younger brothers. If not, he was soon to have close contact with two men who were in Newgate at the very time Philip was hanged. One was Thomas Wells, who arrived with Governor Sorell in March 1817 and became chief clerk in the Secretary’s Office. He may not have been very forthcoming to Bent about his conviction for embezzlement or his pre-transportation stint in prison. But Bent probably had numerous discussions about old times with his assistant printer Joseph Williams who was, like both Wells and Street, convicted at the April sessions. His chequered career path had crossed at least twice with that of Bent’s younger brother Benjamin. Philip’s older brother Thomas, like Bent, possessed a useful skill set. He had an equally rapid rise to success in the new colony, and became another shining example of how a prisoner with skills, energy and a will to reform could make a new life under Macquarie’s enlightened regime. In 1813 he received a ticket of leave on condition of remaining in Pitt Town where his smith’s skills were much in demand. On 5 June 1815 he was granted a conditional pardon. Thomas steered clear of any political involvement and went from strength to strength, becoming a merchant, trader in timber, ship builder and ship owner. A quick search of the Sydney newspapers reveals at least 21 vessels owned by him at various times between 1822 and 1838. He was granted land, owned considerable property in Sydney (seven cottages were advertised for sale in 1838) and judging by the furniture offered for sale when he was about to leave the colony in 1839, lived a life of opulence and comfort. His successful career is chronicled in an extensive correspondence in the Colonial Secretary’s files and also in newspaper advertisements and reports. He and his business partner Thomas Hyndes, another early convict who rose to wealth and respectability, had their own wharf on Darling Harbour. If Thomas Street and Andrew Bent did not correspond directly, they would surely have been aware of each other’s careers through the newspapers. Thomas lived with and in December 1823 married convict Amelia Bellars who died on 29 August 1826. Soon afterwards he married Dorinda Cozier, a currency lass some twenty years his junior, who had been servant to Mr. and Mrs. Hyndes. Thomas and Dorinda had a large family, some born in Sydney, others in England during trips back or after their permanent return to Ealing in around 1840. In March 1839, just a few days after the Bent family arrived in Sydney, the Streets left for England in Thomas’s own ship, the Despatch. Disaster struck when soon after leaving port the cargo of wool caught fire. The ship was lost, and for a considerable time the family, passengers and crew were all feared drowned. Bent covered this event in his first Sydney issue of Bent’s News on 13 April. Back in England for good, Thomas was recorded in both the 1841 and 1851 census as a ship owner living in Ealing. An 1846 codicil to his will indicates he possessed both freehold and copyhold property in England. He died at Ealing in 1855 and was buried at nearby Perrivale. The passing of “Thomas Street Esq.” was noted in the Morning Chronicle. His worldly success was a great contrast to the untimely end of his brother, and also to Andrew Bent, who, while his flame initially burned bright, spent his final years in poverty. Dorinda outlived her husband by 22 years. Three of their sons (Thomas Benjamin, Francis George and Frederick) appear to have settled permanently in New South Wales. In 1833 Thomas’s younger brother Samuel Mathyson Street, his wife Mary Anne (née Chester) and four children (Samuel, William, Mary Ann and Thomas Chester) emigrated to Sydney. There were two more sons — John Charles (born on the way out) and Sydney (1835). Samuel set up business as watchmaker and jeweller, initially in Hunter Street. After his death in March 1837, aged just 38, his widow continued the business. She died in 1885 at the ripe old age of 90. Son Samuel became a watchmaker and jeweller as did Thomas Chester. For a short time in the 1850s Samuel Street junior conducted a business in Geelong. In 1855 he made a handsome silver snuff box which was presented by the compositors and others connected with the Geelong Advertiser newspaper to Mr W. F. M’Neill, a former overseer at the paper. Andrew Bent’s oldest son Andrew Bent junior had moved to Geelong in 1848 and was associated with the Advertiser as a printer throughout much of his long life. He may well have been present at the festivities. And so, with the paths and destinies of Phillip Street and Andrew Bent diverging in 1811, it was a curious quirk of fate that Phillip’s nephew crafted the silver plate presented to the printer associate of Andrew Junior in Geelong over forty years later.